I am a person who loves to cook varieties of foods,eventhough sometimes i'll go for routine cooking. Whenever i get a chance to give try to a different dish from the usual one, i wont hesitate a second to make some. If you go through the recipe index, you may notice that i have already cooked and dished out dishes from many International cuisines. Today's post is also from Afghani cuisine, this cuisine resembles quite like Indian cuisine, you can see the influence of Indian cuisine as they use varieties of spices in their cooking. Afghans put lots of time and effects in most of their dishes.Afghans are fond of non vegetarian dishes and they dont use cutlery, they enjoy their food with their right hands with naan, the famous flat bread as scoop.Afghans prefer their food too spicy and hot.Most of their dishes are well known around the world. Their pulaos,kababs,Qormas are quite popular and their cuisine is a blend of the major ethnic groups 'Pashtuns,Tajiks and Uzbeks'. 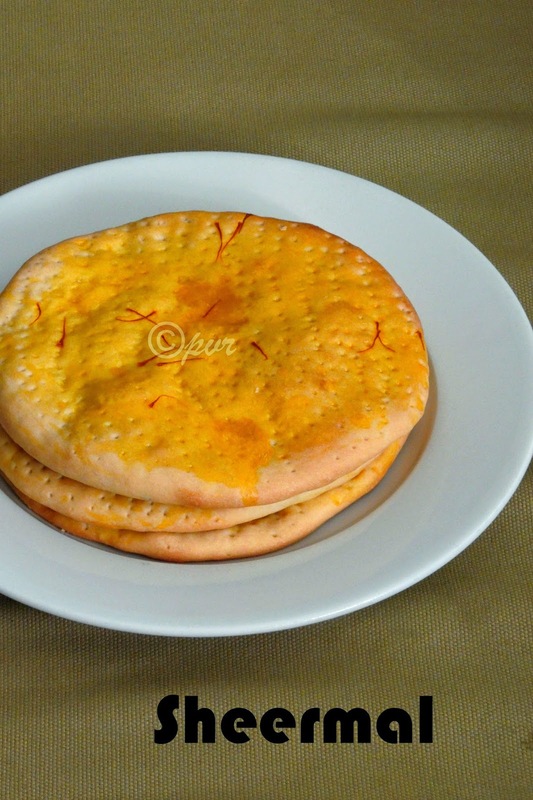 As per wiki ,Sheermal or Shirmal, is a saffron-flavored traditional flatbread made in Iran, Bangladesh, Pakistan, Lucknow region and Hyderabad, India, probably from Persian influences. It is one of the several rare Lucknow and Hyderabadi delicacies in India.It is also part of the Awadhi cuisine and is enjoyed in Old Bhopal, especially with meat delicacies. Sheermal is a mildly sweet naan made out of maida, leavened with yeast, baked in a tandoor or oven. Sheermal was traditionally made like roti. Today, sheermal is prepared like naan. The warm water in the recipe for roti was replaced with warm milk sweetened with sugar and flavored with saffron. The final product ressembles as much as like Danish pastry.Sheermal is sometimes served with Lucknow kababs or alongside nihari.The name of this bread comes from the Persian word for milk which is called 'Sheer'. Some decorates sheermal with a lovely rustic pattern while Lucknowi sheermal garnished with raisins and others garnish with silvered almnds, poppyseeds or simply with sesame seeds for the topping.Sheermal can be eaten with tea for breakfast and a part of a meal with non vegetarian curries like Nihari and vegetarian curries like Kurma. French people start their day with baguette and end their day with this incredible bread.Baguette have their important place of every French household especially lunch or dinner.This long flute like bread is quite famous around the world. Eventhough this bread is easily available in every part of the world, nothing can beat the original and traditionally baked French baguette.I have baked french baguette earlier for a baking event, again i got a chance to give a try to this french baguette for this week's blogging marathon as i picked Tame the yeast as this week's theme. Pradnya of The Pumpkin Farm suggested us french baguette as she was the one among two marathoners who gave us bakes with yeast for this month's tame the yeast event. I stopped buying pestos from stores since ever i started preparing pestos at home. Most of the storebought pesto goes for Herbs, nuts and cheese. If you are making pestos at home, you can make them depending upon your tastebuds.If you would have noticed my recipes index, most of my pestos are vegan with loads of nuts. Making pesto at home is like a child play, apart from grinding you doesnt need anything to do with them. 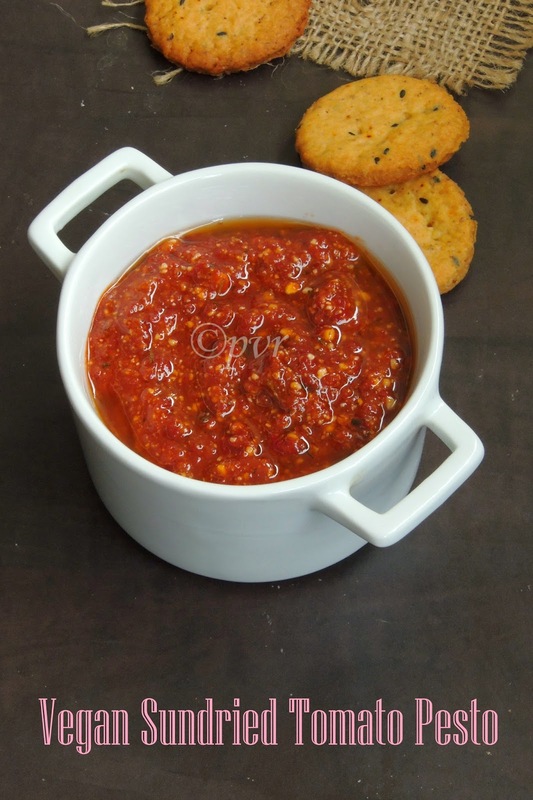 Pesto makes a fantabulous sauce to relish with breads, pastas,simply as a dip for savoury biscuits. Pesto belongs to Italy and traditionally consists of crushed garlic, basil and pine nuts blended with olive oil and parmesan cheese or Fiore sardo (cheese made from sheep's milk).A different version of pesto sauce exists in Provence region of France and its called as Pistou. But Pistou is generally made with olive oil, basil and garlic. Baking is one among my favourite passion. After blogging and cooking, baking took an important place. I never forget to bake atleast for twice a week even i have a very busy schedule with my course and internship.Baking bread at home is definitely very healthy,obviously am trying to bake my dose of bread quite often at home. 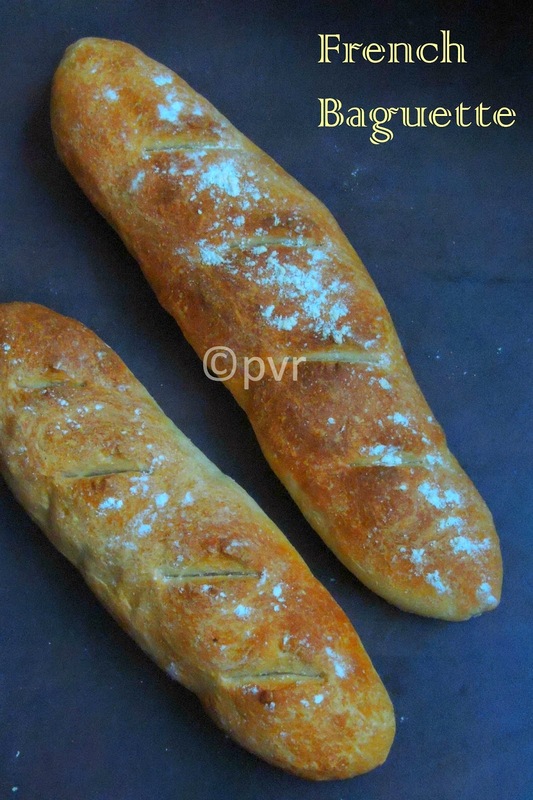 Before blogging, i never tried my hands in baking breads with yeast, taming the yeast was one of my nightmare and i never tried to explore it. But blogging took me in a right direction and now am playing with yeast god. Yeast behaves very good with me hence you might have noticed that i have varieties of breads and bakes with yeast which i tried in my blog. 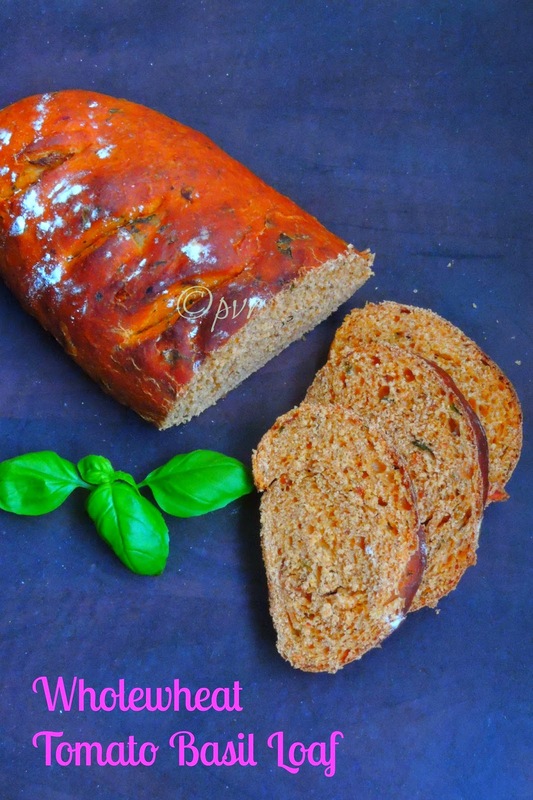 Since i love to bake with yeast i wont hesitate a second to try varieties of bread at home. If i get a chance to bake with yeast, i wont miss it for any reason.I picked Tame the yeast as theme for this week's blogging marathon. Few days back you might have noticed few pictures i have posted in my Fb page regarding a dessert. the famous chocoponoix, we a group of 5 bloggers participated in a dessert class where we recreated this delicious cake with the help of the creator. This cake won the Gout et Santé award by MAAF Assurances, we reproduced the cake with our own way but following the recipe shared by Lucy, the pastry queen behind this innovative cake. We had loads of fun and i got to know more about the other bloggers who were part of this adventure.Created on 2003, This award by MAAF Assurances is created t give more attention to Artisans for their creativity. With my co-bloggers Nadia, Aurelie,Selma,Jennifer we just made this cake prefect as much as like the creator.I have to say big thanks to Nadia for inviting me to this event. Peel and cut the apples into small cubes. With the sugar and water, make a caramel. Stop cooking the caramel with butter. Cook everything all 5 to 10 minutes to reduce the caramel. Put off the heat, add a pinch of cinnamon. Cover with a cling film and refrigerate . Whisk the egg yolk and sugar. Add the cocoa powder and walnuts or hazelnuts . Beat the egg whites until stiff and gently fold into the mixture. In mixer, Whip the cream . Mix the whipped cream and melted chocolate . Put the mousse in a pastry bag . Cut the cake as small circles using a cookie cutter . 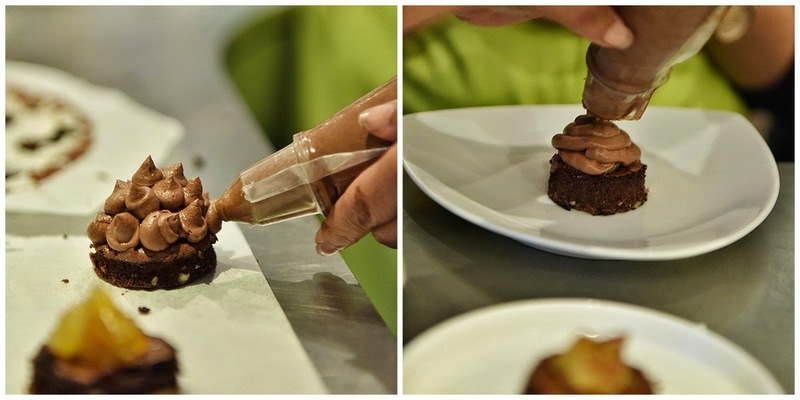 Cover the diced apple with chocolate mousse using the pastry bag . 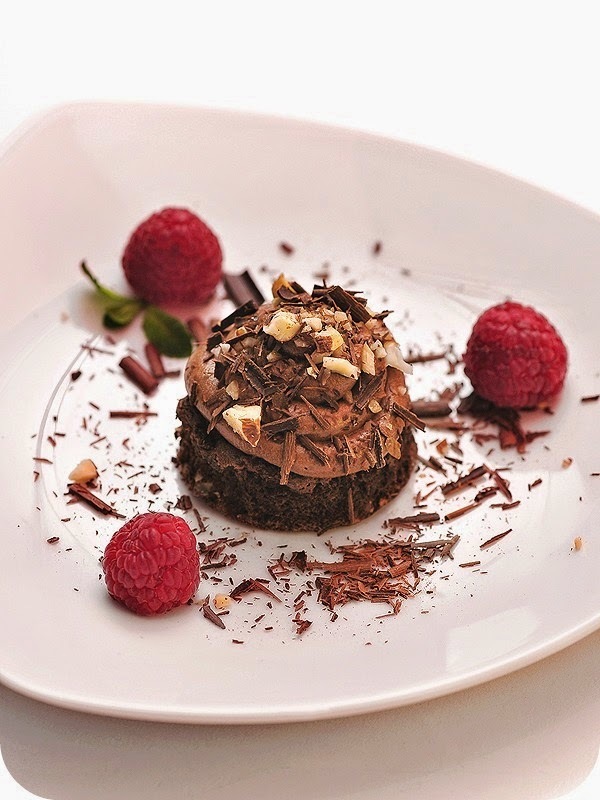 For the final touch ,sprinkle chocolate shaves and walnuts or hazelnuts . Créé en 2003 par MAAF Assurances,le Prix Goût et Santé a pour objectif de valoriser les artisans des métiers.Le 6 octobre dernier a eu lieu la finale au Pavillon Elysée Lenôtre à Paris. Suite à cette finale, une soirée a été organisée à l'Atelier 750 g au cours de laquelle 4 équipes ont dû revisiter les recettes des 4 gagnants en compagnie de ces derniers.J'ai participé à cet Atelier avec quatre autre bloggeurs culinaires, on a passé de bon moment ensemble. Je remercie Nadia de Paprikas qui m'a invité à participer à cet atelier. Peler et couper les pommes en petits cubes . Avec le sucre et l'eau, réaliser un caramel. Arrêter la cuisson du caramel avec le beurre. Ajouter les dés de pommes. Recuire le tout 5 à 10 min pour faire réduire le caramel. Hors du feu, ajouter une pincée de cannelle. Débarrasser sur un film alimentaire et mettre au frigo. Blanchir les jaunes d'oeuf et le sucre en poudre . Faire fondre de chocolat et l'ajouter au mélange. Ajouter le cacao en poudre et les noix ou noisettes concassées. Monter les blancs en neige et les ajouter délicatement au mélange. Verser le tout dans un moule de 20 cm que vous avez bien beurré et fariné. Au batteur, faire monter la crème liquide en chantilly. Mélanger la crème montée et le chocolat fondu et tiédi. Mettre la mousse dans une poche à douille. Dans le biscuit, découper des petits ronds à l'aide d'un emporte pièce. Couvrir les dés de pomme de mousse au chocolat à l'aide de la poche à douille. 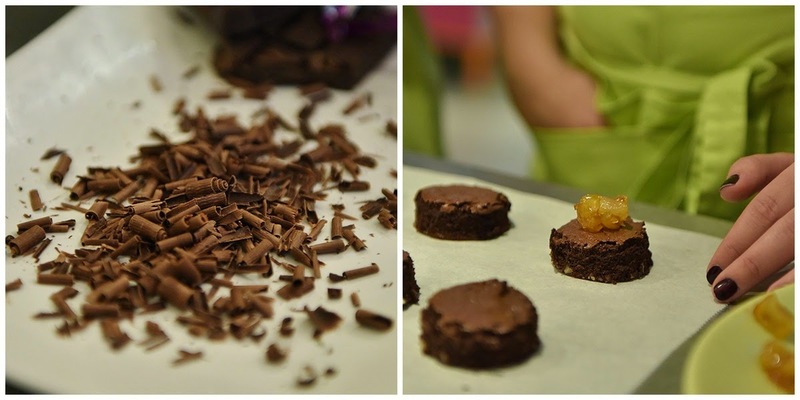 Pour la touche finale, saupoudrer les petits gâteaux de copeaux de chocolat et de noix ou noisettes concassées. Pound cake, this soft and spongy cakes are my H's favourite, he just love to have this cake with his cup of coffee. Whenever i get a chance to make pound cake, i dont hesitate a second to make some. When i picked lemon recipes as theme for this week's blogging marathon, i know i'll be making citrus flavoured pound cake. 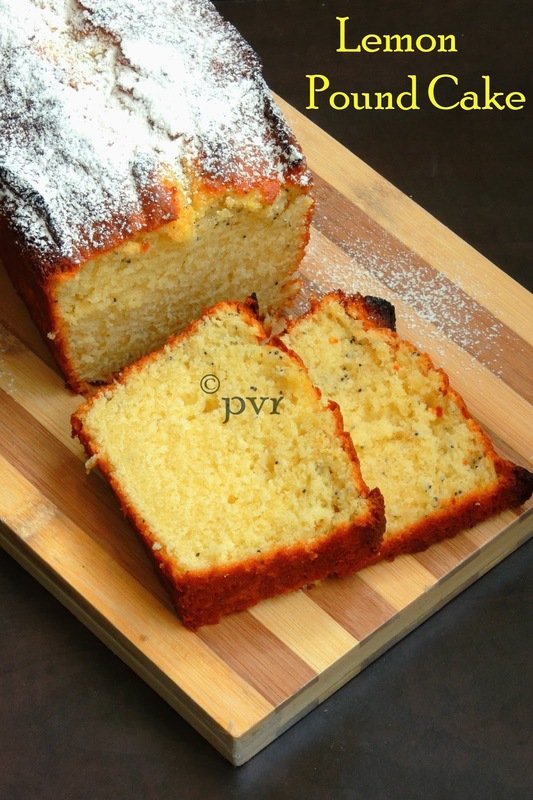 A slice of pound cake with your favourite drink makes an excellent filling breakfast or evening snacks. Pound cake may sounds bit heavy because of butter and eggs, but once a while one can make and enjoy this absolutely spongy and dangerously addictive cake. Coming to today's Pound cake, i just used Eggless Lemon curd, lemon zest and freshly squeezed lemon juice.Omg, trust me this pound cake is simply awesome and you cant stop having this incredible spongy cake. 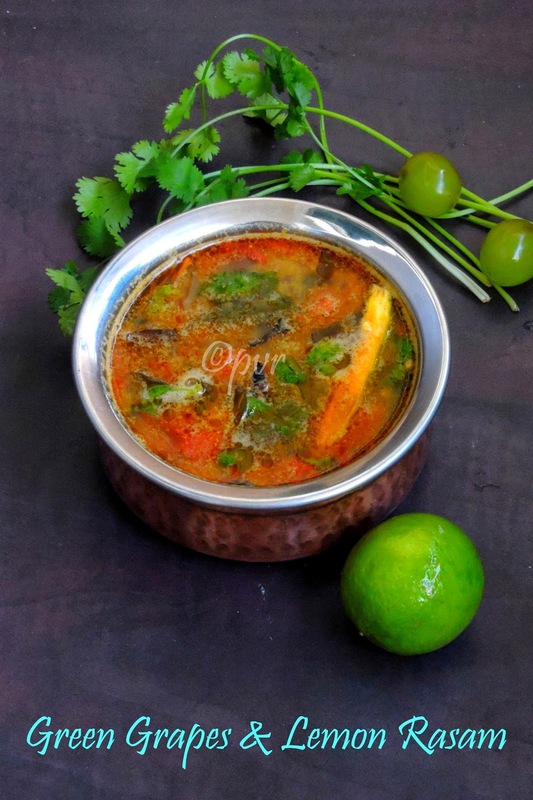 Rasam, this South Indian soup is a comforting food for many South Indians, i have seen people surviving for many days just with a bowl of the rasam. Rasam served with simple potato fry or friyums is just enough for me to finish my lunch happily, if you are a frequent reader of my space you might have noticed that i have already shared a beautiful collection of variety rasams.We are rasam family, while at inlaws place rasam is a occasional food, however now my husband is a great fan of my rasams. Ok lets go to today's recipe, my today's post goes for green graps and lemon rasam. I have brought a kg of green grapes from our farmer's market but unfortunately some green grapes were sour and none at home want to have. Instead of trashing them, i tried this mildly sweet and sour rasam to serve with rice for our lunch. For my surprise, everyone at home enjoyed thoroughly and this rasam was a big hit even among with my kids. Paneer, this famous Indian cheese is everyone's favourite at home and my fridge will always have this cheese. If i dont have enough time to make paneer at home, as like everyone i'll go for the store bought ones. Paneer is a very versatile cheese and this paneer cheese can be cooked with anything or can be cooked as anything. From starter to dessert, paneer can be prepared in many different dishes. However my favourite dish with paneer is always the North Indian side dishes especially butter masala or tikka masala. But my today's recipe goes for a different rice dish. 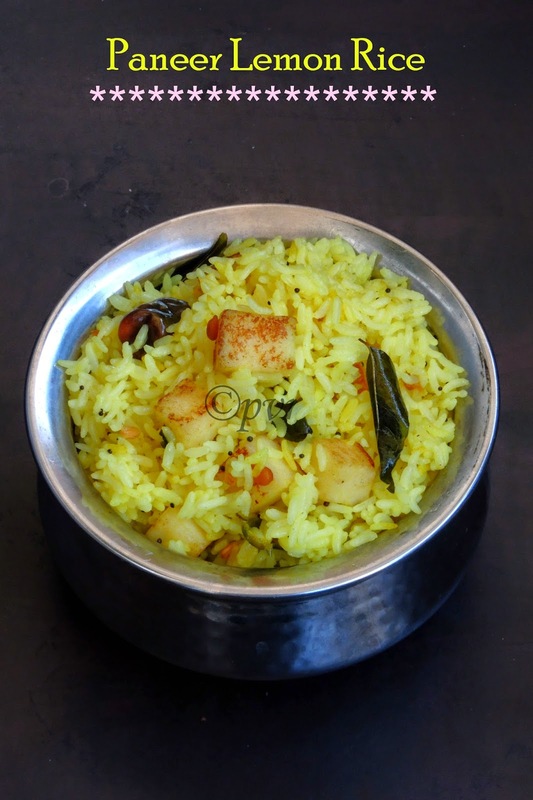 Usually we make lemon rice simply with lemon juice, cooked rice with usual spices, but for a change i tried adding some leftover paneer cubes along with, trust me pan roasted paneer cubes added to the lemon rice makes a different delicious rice dish. Paneer while having with gives this mild tangy lemon rice gives an excellent taste and texture, we simply loved it. 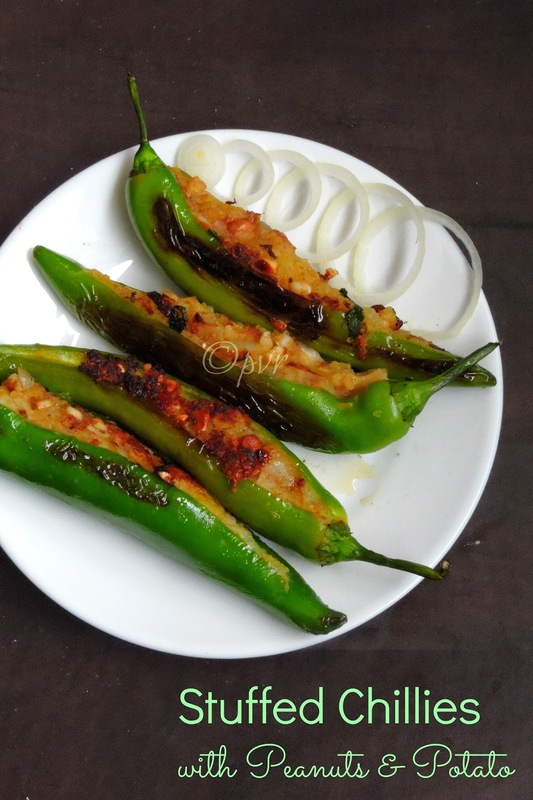 Stuffed vegetables are my personnal favourite, whenever i get a chance to make i wont hesitate a second to make some. Its been a while i had some stuffed vegetables, and i have been looking for a chance to make some stuffed chillies especially with potatoes. I have been challenged with two incredible ingredients by Sathya Priya of My Kitchen Odyssey for this month's Shhhh Cooking Secretly Challenge started by me few months back.Every month i'll combine a pair with the members, then later we secretly discuss with our pair to exchange two secret ingredients among us, finally we cook with those secret ingredients which we will post on next month between 16-18th during every month. Whoever finished cooking with their secret ingredients shares their picture among the group members befor the revealing date.Obviously we are having loads of fun by guessing the ingredients and have real fun with the members. Also this group brings out the creativity from the members since the two ingredients given by the members will definitely pull you to dish out interesting dishes. Badam halwa or Indian almond fudge, which is highly delicious and definitely a quick sweet to make.This month's Indian Cooking Challenge,a monthly event where we cook dishes from various regions of India, Srivalli challenged us with a simple and hasslefree badam halwa suggested by Vaishali.Seriously since am doing my internship i dont have much time to give a try to this halwa earlier until today, eventhough this halwa is super easy to make, apart from stirring. I soaked the almonds yesterday and finished making this halwa this morning. Loved the simplicity of this dish, we tried this sweet with quarter cup of almonds hence the quantity of other ingredients may sounds very easy to remember. 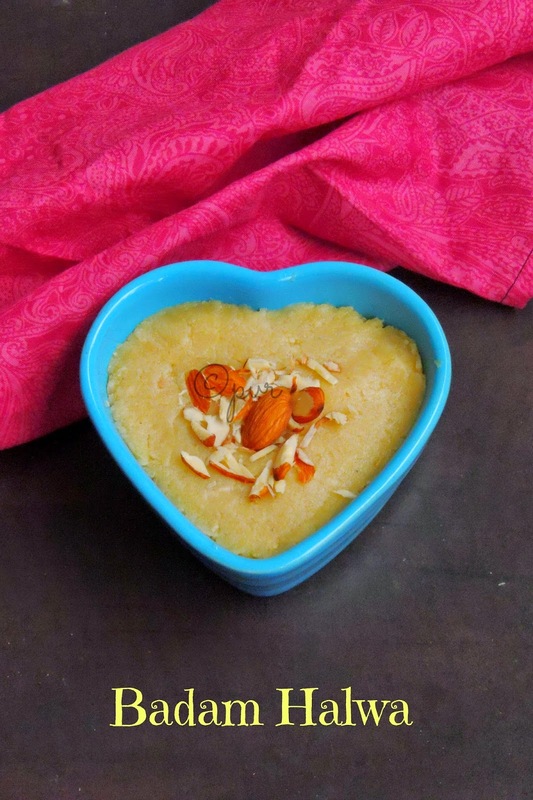 Nothing much is needed to make this swet, obviously you can make this halwa easily within few minutes if you have sudden guests at home. 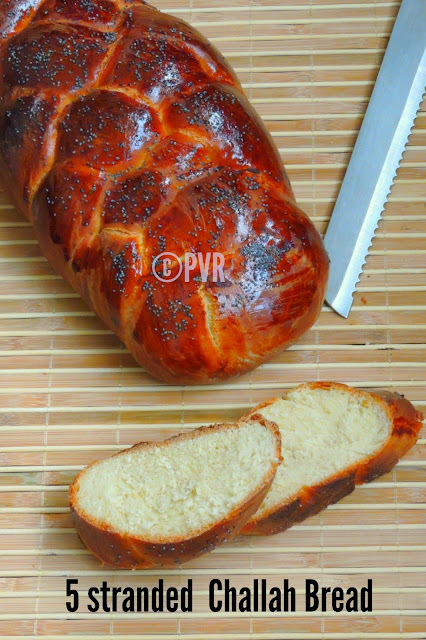 Challah bread, i have already tried couple of challah breads but this bread is something i want to make often at home whenever i feel like baking something eggy rich bread.Challah bread, dont need any introduction, this bread can go for upto 12 strands, i have already prepared this 6 strands Braided Challah Bread,this 4 strands Braided challah bread but still i want to make this bread with 5 strands. Finally i baked this super golden crusted 5 strands Braided challah bread for this month's Home Baker's Challenge, a monthly baking event and this baking group is running successfully more than a year.For this month's challenge, we were bit busy with our personnal stuffs obviously i opted for a challenge which made our life easier. This month's challenge is to bake from the challenges already suggested by the hosts during the past months. You might have crossed many plum cakes in your life, even i have seen so many but still today's post is something special for me. This cake is very close to my heart as i learned this cake from my neighbour aunty when i was just 13. Usually this cake batter is prepared three days before baking as the dry fruits and nuts goes for two day's soaking. During 80's, oven at home is definitely a luxury gadget and whenever we plan making cakes at home we make through stove top or either my younger brother will carry the cake batter to the nearby bakery for baking. 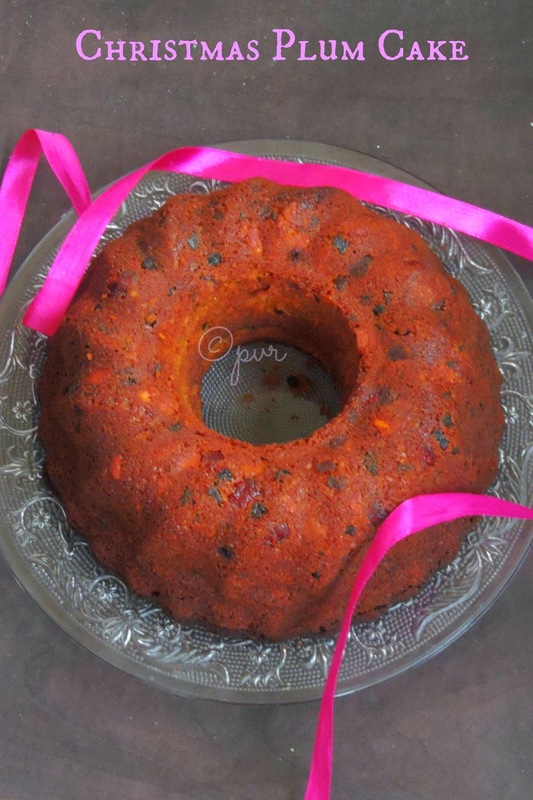 I know most of us might have already crossed this baking experience atleast once if you are born in 80's.Coming to today's post,as i told earlier this cake is a traditional Pondicherry plum cake. Since Pondicherry cuisine is a multicultural cuisine obviously you may cross varieties of foods from different cuisine. Personally i think this plum cake might be carried from Kerala cuisine coz every year this cake is baked during Christmas eve to cut and enjoy to celebrate the birth of Jesus.The speciality of this cake is its completely Alcohol free,and the rich colour of this cake is coz of the caramel syrup used for soaking the fruits. Kajira/Gejira/Gaejira/Maida biscuits/Sangu Biscuits/Shell biscuits, name this biscuits as anything, this biscuits have their important place in Pondicherry Christmas treat. This fried biscuits are my favourite. When i was in India, for every Christmas i'll wait to get my dose of this crispy maida-semolina biscuits from my neighbour aunty.This biscuits ressembles very much like Goan Kulkuls, not to forget that Pondicherry cuisine is also influenced by Portuguese, Andhra, Kerala, and many more cuisines. Somehow this maida biscuits came to Pondicherry cuisine many years back. Coming to this biscuits, these crispy beauties are prepared with maida, powdered sugar, cardamon powder, egg, coconut milk, semolina, baking powder and butter.This fried beauties will just melt in your mouth, trust me these deepfried these biscuits are dangerously addictive. Been born and brought up in Pondicherry, i finished my schooling in Catholic schools, obviously Christmas is one among my favourite festivals. Pondicherry is a city of Multiculture and you can see varieties of cuisines there,needless to say Pondicherry cuisine is quite a medley of different cuisines. 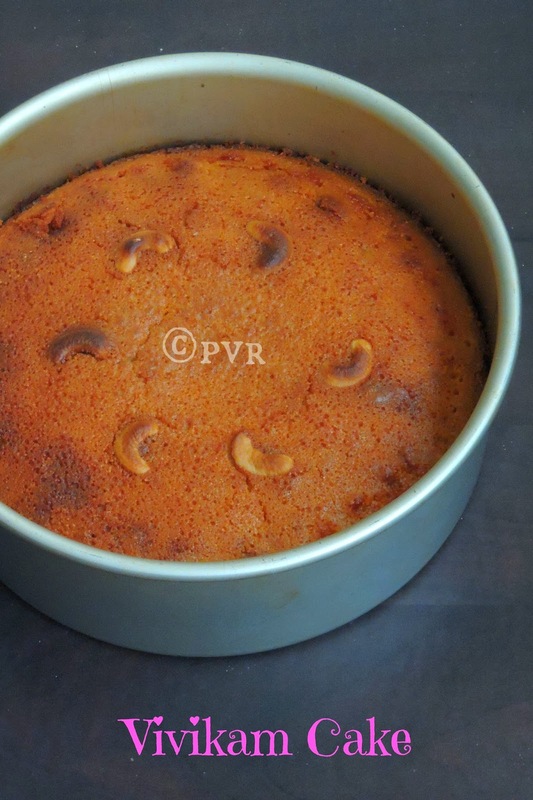 Coming to today's post, Vivikam cake is one among the famous christmas cake prepared every year by the Pondicherry christians.Vivikam cake can be also called as Puducherry cake, puducherry means Pondicherry in Tamil. Every year, on 25th december, this cake will be distributed to neighbours and relatives.The speciality of this cake is, most of the ingredients are prepared bit earlier than usual christmas cake. Some bake this cake very much earlier as this cake can be preserved very well for many days. 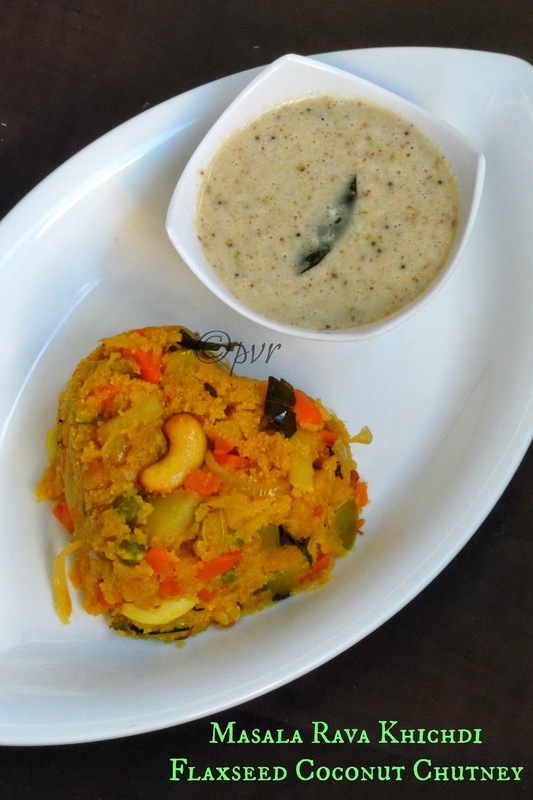 Khichdi, this breakfast dish is simply prepared with semolina aka rava with a variety of vegetables and whole spices. This South Indian breakfast dish is definitely a filling dish and i love it to the core.Honestly speaking, am a great fan of Masala khichdi than the easy breezy upma eventhough upma is my H's favourite. Some may call this khichadi as masala khaarabath,Khichdi with loads of veggies is always my favourite.You can add any sort of veggies to make this delicious khichadi or else cook just with onions and tomatoes. Serve this flavourful khichadi with thick coconut chutney, i can have it anytime. Most of the South Indians especially the Tamilians will definitely enjoy their breakfast if they are served with dosas with vada curry. 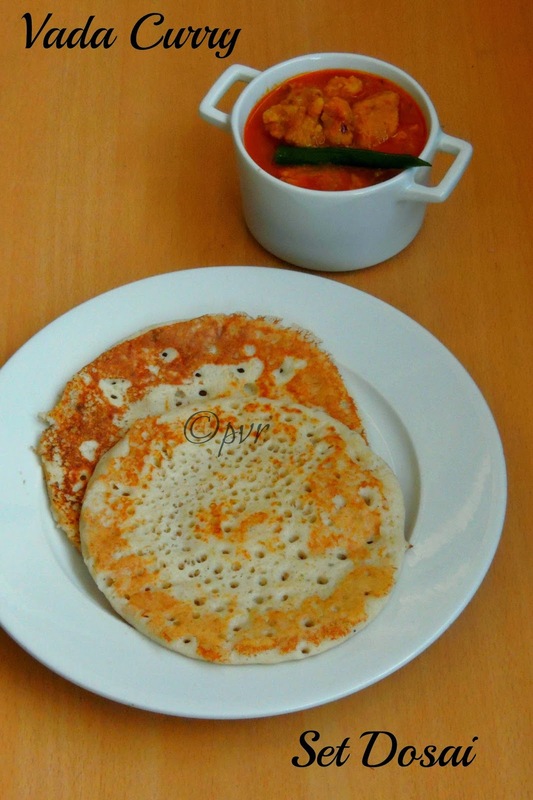 Dosai, this south Indian breakfast dish well known as the younger sister of Idli makes an excellent breakfast or dinner. 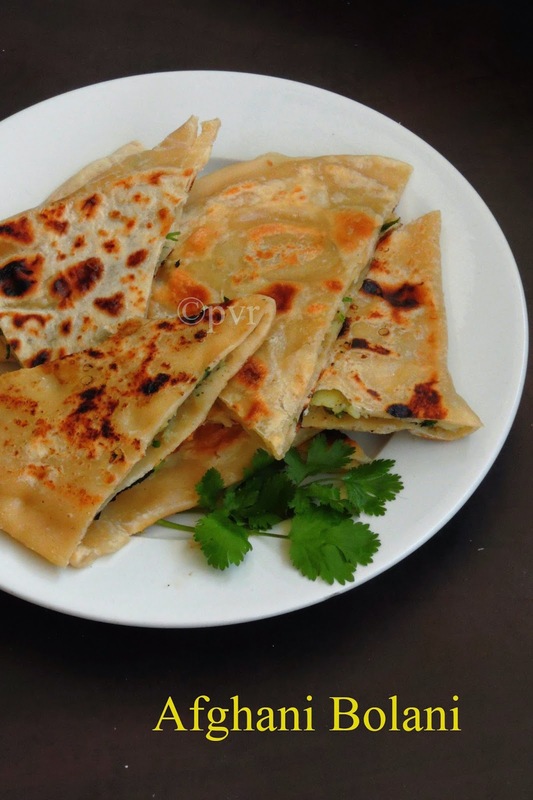 Literally dosai is Indian crepes which is simply prepared with rice,urad dal batter. The first day this batter can be used for making idlies, after two days you can make crispy dosas out of this batter, if the batter turns bit sour you can make puffy uthappams out of it. This batter makes delicious three dishes depending upon the fermentation and the sourness. With so many variations, one can make variety of foods with this batter. Obviously every South Indian household will definitely have idli-dosa batter at home. Also idly batter is a life saver, if you have sudden guest or bored to make different breakfast, this batter will be very handy to make idlies or dosas out of it. Coming to today's post, Set dosai and vadacurry, this both dishes makes a prefect pair. A prefect combination to enjoy thoroughly if you love to have South Indian breakfast to kick start ur day. As a foodie,i love to have food with prefect side dish or gravy. I will never fail to take much efforts to serve rice or rotis with prefect a side dish and gravy. If its poori, i cant imagine serving poori just like that, obviously i'll make potato masala to serve with. Indian cuisine is vast, obviously we Indians makes varieties of foods. From South to North, each dish is served properly with a prefect gravy and side dish since ages. Obviously most of us follow it ritually and traditionally. We cant serve few dishes just like that. Dishes like dosa, idlies are usually served with varieties of side dishes, but some dishes need to be served only with a particular side dish. 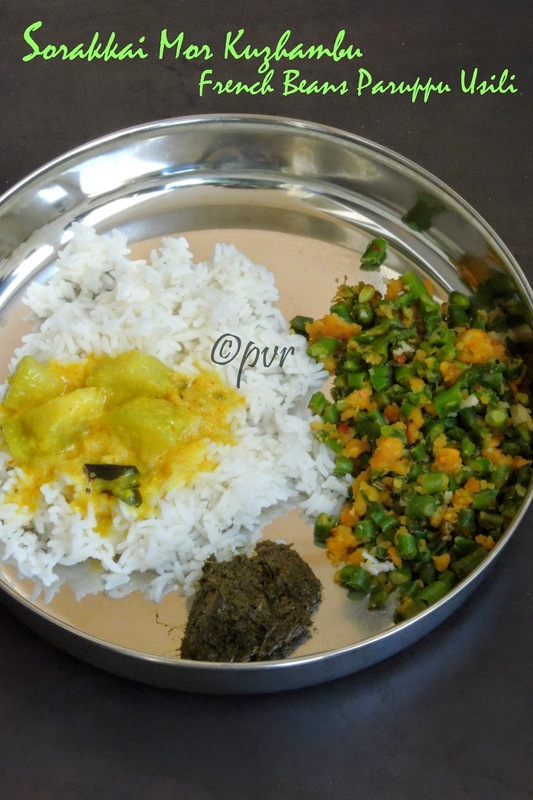 One among those combination is Mor kuzhambu( a buttermilk curry) and parupu usili(a dal stir fry). 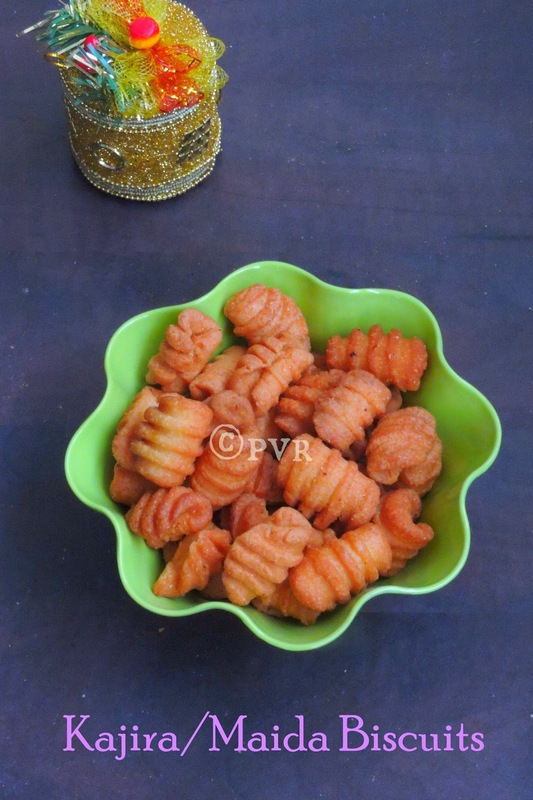 My mom makes excellent mor kuzhambu with varieties of vegetables or simply with vadas. If she makes mor kuzhambu obviously she will make paruppu usili, this prefect pair makes a super filling and satisfying lunch when served with rice.